These past days have been crazy, so much stress at work, I am so happy that I have this blog to take my mind away for a moment, enjoy beautiful things and get to talk about fun stuff! 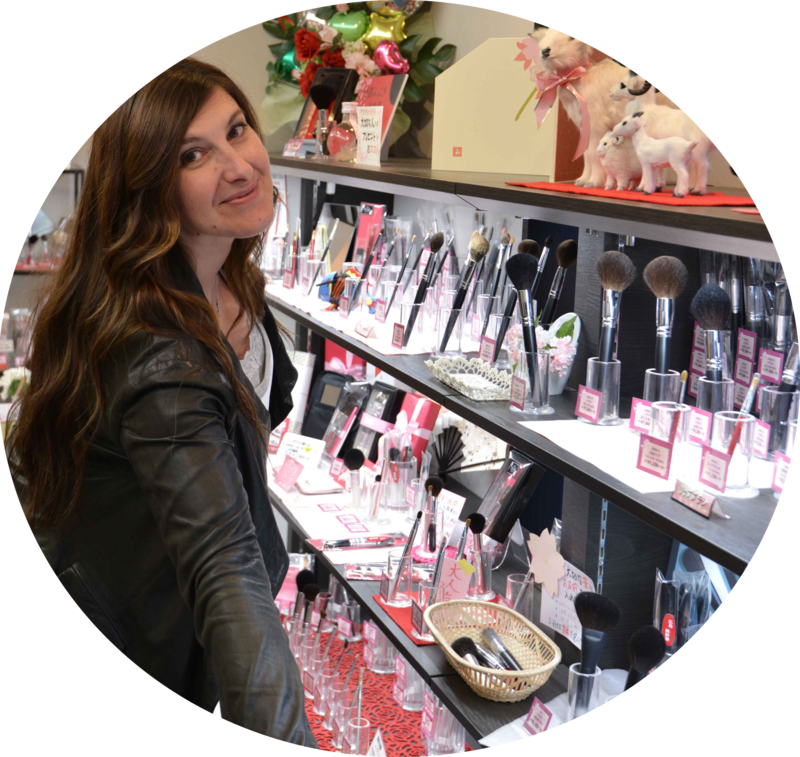 I haven’t even been able to browse holiday collections lately, I am happy when a friend or a company newletter or PR team points them out to me! I have the feeling that I am missing on items that I would sincerely enjoy, missed on a few already. I still got a few that completely rock my world and want to post about them asap so that you don’t miss out. I do have a lot of reviews in draft mode now but I like to have a proper feeling about the products before I post and sometimes it takes more than a couple of days. I am writing about Natasha Denona palettes, Lila and Star, probably my top palettes ever, I am writing about Rae Morris new line and about my Japan haul, haul that was very selective but still managed to get a few HGs. 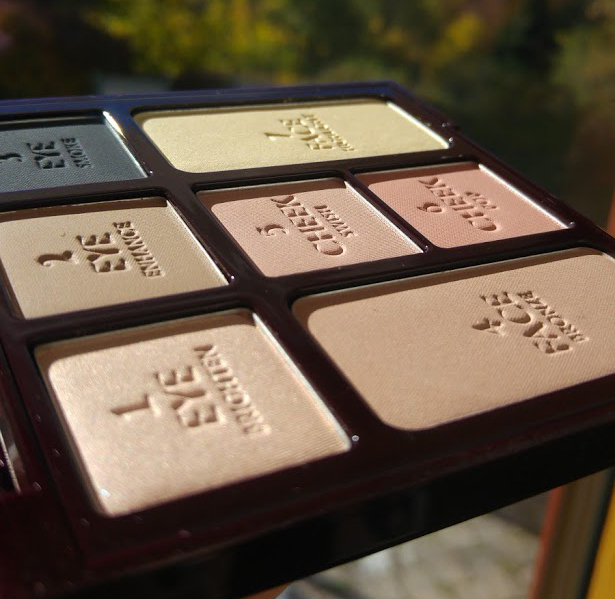 Today it’s Charlotte’s post, it’s a Limited Edition palette so if you like these all-in-one palettes you have to jump on it. 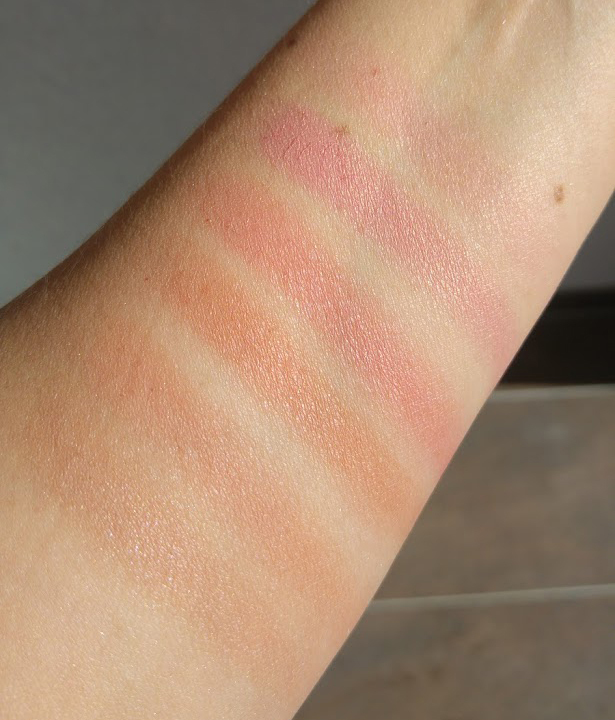 I got it on Saturday, was sent to me by Beautylish, I have used it 6 times in 2 days, not because the looks were fading but because I could not believe how much I loved it! First of all, the face products, I have two Cheek to Chic (Ecstasy and Love Glow) and the Filmstar Bronze & Glow that I can compare to. 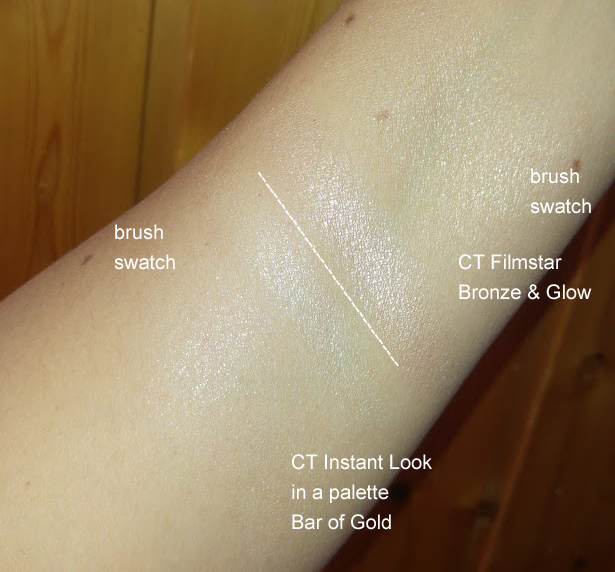 The Bronzer is a lighter and slightly more glowy version of CT Filmstar Bronze & Glow, to me they are two different shades on the skin. The Filmstar is a little darker also with glow, acts more like a real bronzer, but this one is more like a perfecting powder that is evening out the skin, brings a bit of tan on fair skin and a lot of life to a dull complexion, totally enjoy this, it reminds me of the very first safe bronzers I ever used, I knew I could use them as bronzers or blushes and even to add some tiny coverage where needed. I would purchase over and over and over again this little bronzer, to me this is enhancing without looking like make-up and I can actually use it without foundation underneath, I did and it was just delivering very healthy looking skin, this is a benefit if you do not use foundation at all. 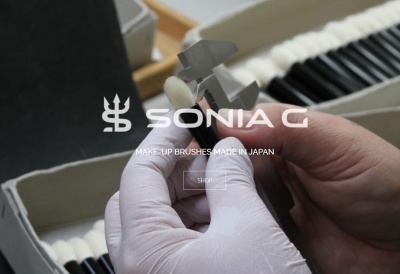 I like to apply it with a dense brush, otherwise I have to go back and forth to build the application, I have used Wayne Goss 12. For the same amount of swatches, this is how the color looks on NW20 skin (with flash). 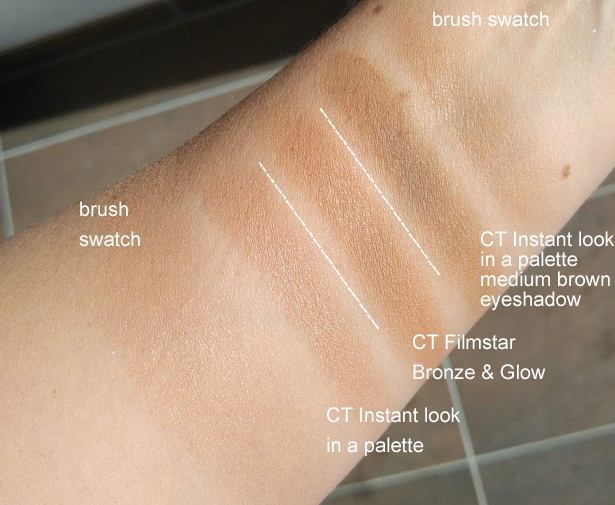 I have also swatched the medium brown eyeshadow for reference. This eyeshadow can be used as face contour but you have to use the right brush, for example her little face contour brush (the pointy one) is appropriate for that, it fits in the pan and doesn’t leave harsh edges, I don’t have it but I have similar ones so I know it won’t be an issue, only issue is that it’s a bit rough for me, reason why I don’t own it. The two blush shades are stunning, it’s the kind of blush that looks like nothing on the pan and on the cheeks it’s perfection. 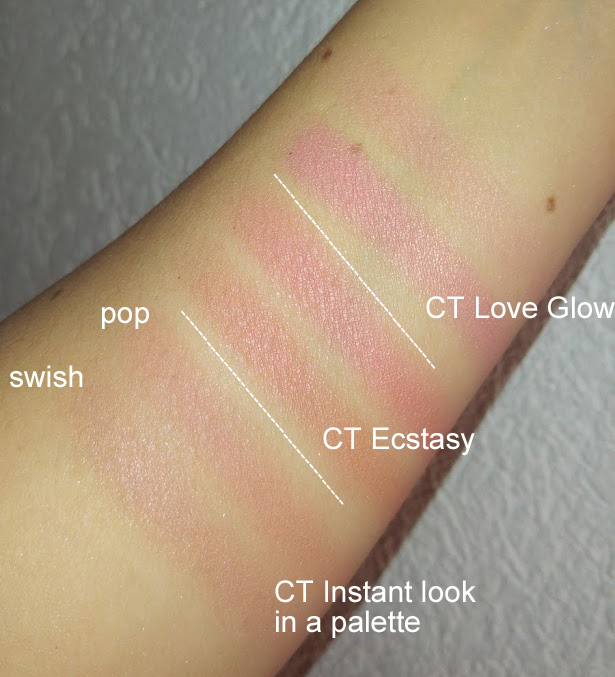 Cheek swish is the peachy beige and the pop is a natural rose, pop is matte but swish has some subtle glow. I was not expecting them to look so amazing on the skin, it’s the perfect match to pair with a smokey eye, but these are not boring neutral colors, they really look amazing on the cheeks. I want to know if this is from her permanent line because I will purchase them for daily use. 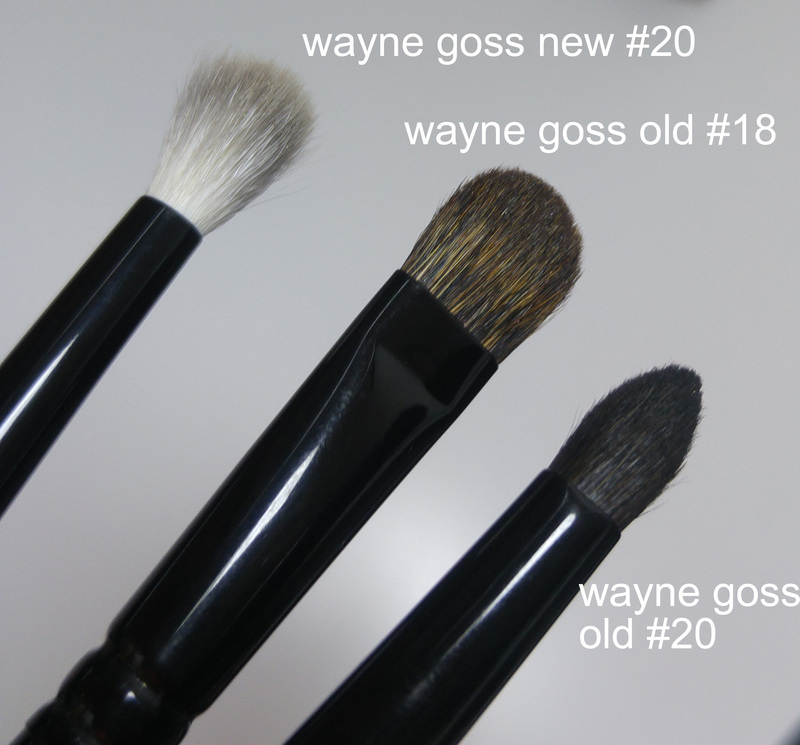 You are supposed to swirl your brush on the swish and just place a bit of pop in the center, it’s what I do and I use either the Wayne Goss 13 or the 02 or the 14. It’s the only brushes I have used with it because I had this palette only since Saturday. You can use dense brushes but they should be reasonably small so that you don’t dip into the black shadow at the top right corner. I am going to contact Beautylish in order to know if those blushes are available on their own, will update here if they are. Now we get to the highlighter pan, this looks very intimidating in the pan and very yellow, in real life it is not, it’s actually perfect. I had no idea this would be so stunning, this is the perfect universal highlighter, not too yellow, not too pink, not too silver but there is a bit of all in here. 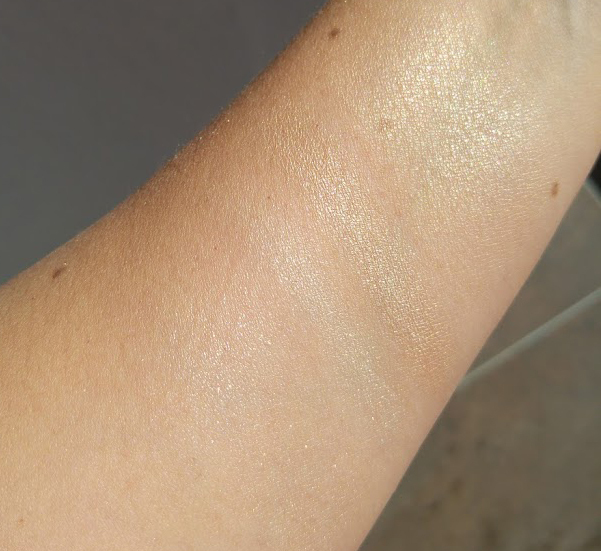 The texture is see-through which I love, if you compare the swatches with the highlighter in Filmstar, you will see this difference, the Filmstar has a more opaque base if you pack it, that doesn’t look as good now on my skin. This Gold Bar doesn’t sit in fine lines, I can wear it very subtle or dramatic but I need a strong brush, this is not easy to pick and of course since I want to pack it, I need the means to do so. Just use any brush that fits in the pan and more on the rough side. I will for sure, definitely, purchase this again. It’s one of the best highlighters that I own, right now I use Cle de Peau insanely expensive ones but I really love highlighters and they have to be really good to work on my ageing skin. The face products are really what stands out to me, but the eyeshadows are something I’d use repeateadly. This reminds me of my very first Sephora palette, it was the Smokey palette with 4 shadows, this has only 3 but they are spot on. 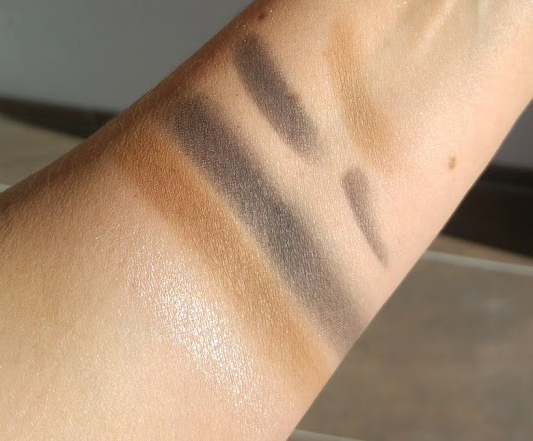 I am writing another review in parallel where I mention that I want a black shade in each palette that I own 😀 I love black shades, this one is not pitch black and at first I thought it would apply patchy because the fingers swatches were not impressing me but with a brush it swatches just great, clean, even and no fall out. 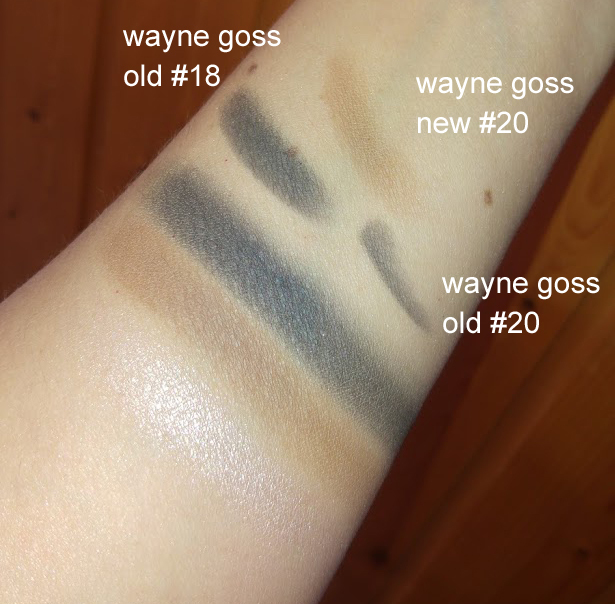 The medium brown is the perfect crease or transition shade for the smokey look, I used Wayne Goss new #20 brush to apply the brown shade in the crease, then I used that same brush to apply the black on the mobile lid towards the crease and then the old Wayne Goss #20 pencil for the lower lash line. I used Wayne Goss brushes but I have to mention that my favorite brushes from CT are the Eye Blender and the Smudger , these two are really great, soft and efficient. I did not use them today because her blender is a bit too big and I wanted to use the same brush for the black and the brown shades. Also the Smudger is at my friend’s house at the moment as she was curious to try it. The result is not the darkest most opaque smokey black that I have seen but it’s easy to apply, the whole eye look takes seconds to achieve, fades evenly and does not crease (I used it on top or either Nars or Urban Decay bases and after powdering). I would totally repurchase this and I will most certainly use it up, specially those face products, but it’s Limited Edition so I I will try to get my hands on the individual shades if they exist. The Bar of Gold individual pan seems to contain 4.5g and costs (or costed) $42 (I don’t know if Charlotte Tilbury is bringing this one back and when or if she has already). Overwall, it looks like the palette is a good value for money. The palette is available on Beautylish’s website here, retails for $75. This palette was sent to me free of charge. CHARLOTTE TILBURY SMOKEY EYE BEAUTY was last modified: October 16th, 2017 by Sonia G.
I had read that the blushes in the palette are one of her full size cheek to chic shades, but I can’t recall which one. 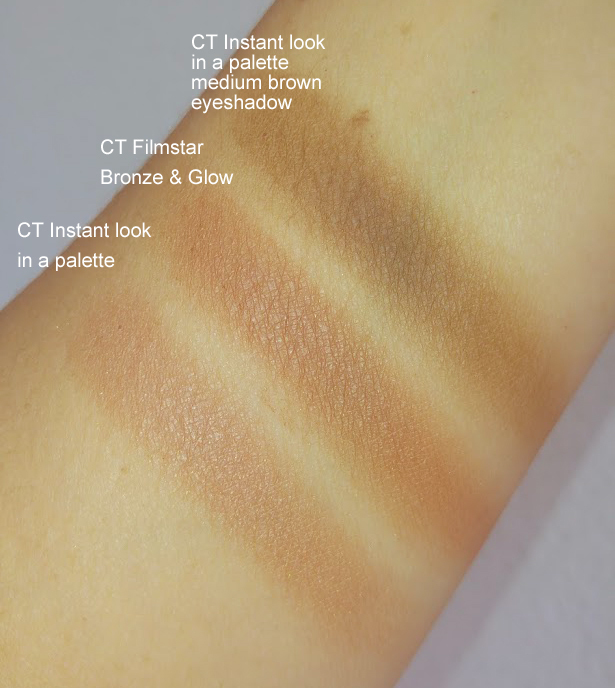 They were also saying it’s supposed to be the same shade of bronzer as the light/medium Filmstar Bronze/Glow but your swatches show that isn’t the case. I did write to Beautylish, I hope they can reply reg the blushes, thank you for mentioning! I need this full size shade. Hmmm to me it is not the case, those two bronzers definitely look different! Could it be that my Bronze and Glow is “old” and this causes now that difference… I wish I knew for sure. 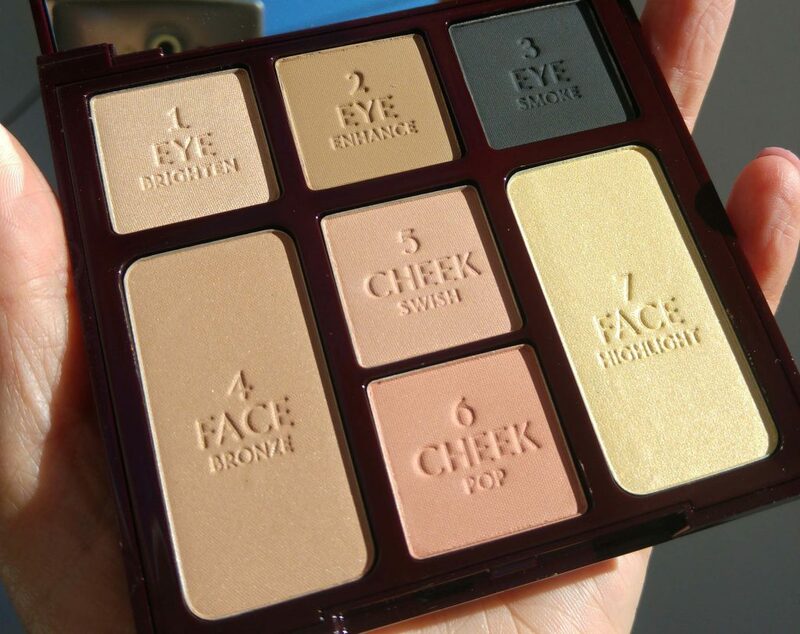 In Wayne Goss’s review of this palette, I think he says the cheek color is First Love. Thank you Alisa, and I actually bought it as soon as I knew, I use it so often!